To celebrate the kittens’ first birthday, we’re doing our first giveaway! 2. 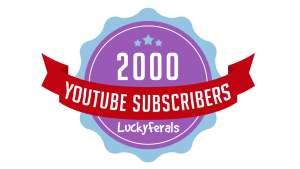 Leave a comment under this post letting us know what your favorite video is on the Lucky Ferals YouTube Channel. Giveaway ends at 5pm Eastern Time on Thursday May 11, 2017. One lucky random winner will be selected within 24 hours of the end of the giveaway. The winner will be notified via email within 24 hours of the random selection. (Please make sure you leave a comment with the email address where you want to receive your winning notification if you win.) The winner has two weeks to respond with their shipping address and claim their prize. In the event that the winner does not respond within two weeks, the prize is automatically forfeited and will go to the next random winner. Thanks for watching the videos! Thanks for subscribing to the channel! LOVE your videos but REALLY love when Splash had his tummy rubbed. 🙂 Hope I win! Hugs from Idaho. 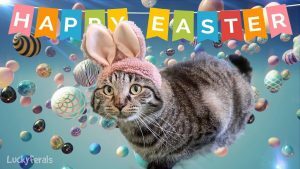 Love the video where the cats are playing with the Easter eggs. My favorite video was when the cats got into the cupcake wrappers. I was cracking up, my cats do stuff like that too. I havenèt been subscribed to your channel for very long, only a month or two. I like the “Cat Reacts To SmartyKat Feather Whirl Electronic Motion Cat Toy” video the best. It’s fun to watch the cat play. I enjoy all your videos because your a wonderful kitty mommy, like me. But, I’d have to say, I loved the IKEA doll bed video. I can’t wait to get one for my fur babies now. What got me hooked to your channel was and it is still my favorite one is the one where Stella came inside for the first time. She is so sweet! What’s not to like? Every video is awesome! My all time favorite is Simba and Splashy playing with the rolled up carpet, then Stella shows ’em how it’s done right! I also loved watching all four eating together, sure miss Boo. The outdoor solar sun room in the rain was brilliant. And I have to admit, watching your videography skills during kitty birthday cake baking was extraordinary! How in the world did you manage the camera so well? 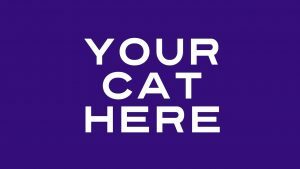 My kitty Dante and I are on a budget and would benefit greatly from your giveaway. Wish me luck! Best. I like the 3 videos when the cats first entered their new forever home for the first. Not knowing they would fall in love with all the food, the spoiling and the loving their getting. Have A Great Blessed Day today. My favorite video is when the two cats are in the window sharing the spaces. Cat brothers in the window. Fun to watch them play. My favorite video is Simba’s chew toy. I hope to win, I have a feral cat who just showed up a couple of weeks ago and she is pregnant. I plan on getting her spayed after her litter, and finding homes for all but one kitten. But, I don’t have any cat supplies except for food. So winning would be great. My favorite is Feral Cat Comes Inside For The First Time . 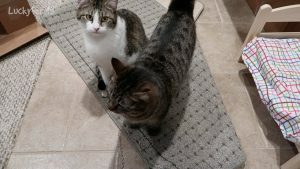 Cats behaving badly – where did you get those cupcake wrappers? Haha …cats are so sneaky and smart. They know exactly what they are doing. My boy is very good, but he is getting old. Awe so many cute videos but my favorite would have to be the little feral kitten giving you high dive. Too sweet…. curiosity got the best of the little guy, he just had to come touch you. I like Feral Cat Comes Inside For The First Time. She reminds me of my own cat. I like so many of them, but Feral Kittens By The Back Door is cute. I like the Cat Brothers In The Window video! My favorite video is Cat Brothers In The Window. They’re so cute and look like they get along really well. My cat Libby is best friends with my dog Tillie. Tillie is 14 years old and Libby is so good about looking after her. She actually lets me know when Tillie needs to go outside or come back inside! I love her so much!! I liked – Lucky Feral Cat Waits For Breakfast By Back Door . Loved the Cat And Kitten Play With Football Toy * Super Bowl 2017 video, the momma cat looks like one of mine! Thank you for caring for these feral cats! When we’re able my family is wanting to do the same! I just subscribed and your videos are very cute! My favorite video is the ‘simba has a new chew toy- petstages wiggle worm chew toy’ good review and I was actually wondering about this product. Thank you for the giveaway and happy birthday to your babies!! I love the kitties playing with the eggies, thank you so much!! I love the way you write. I like all 3 videos . So cute! I have to make my cats some cake tonight! I like the cardboard cat house video. I enjoyed the ikea doll bed. I remember childhood cat claimed my doll bed for his own…remembering how comfy he found it, it would be a fun addition to my cat furniture. The Ikea doll bed video is cute. I just found this site and the videos are adorable. I especially love the video about the Cat Paw Print Cake for Splash, Stella, and Simba’s bday! That Wilton Paw Print Cake Pan is amazing and I am considering getting it to celebrate Slippers bday! My favorite is the Cat Paw Print Cake – Happy Birthday Splash, Stella, and Simba! – Wilton Paw Print Cake Pan. Absolutely adorable! Love Stella in “Feral Cat Comes Inside For The First Time”. the Cat Food Birthday Cake video! I live in a small college town, so feral cats are everywhere after school ends.love the video on making the cat house out of rubber maid containers. Lucky feral cat waits for breakfast by backdrop! My favorite is the Lucky St. Patrick’s Day Cat With Dancing Leprechaun. The cat in it looks a lot like my Desiree. My favorite is the Cats React To IsYoung Pet Fountain – Product Review Unboxing. Too cute. cats reacts to pet fountain…I just got my kitty one too. My favorite is Feral Cat Comes Inside for the first time, I love Stella! I like where Stella comes in & takes a long nap. I have 3 inside cats who came from different addresses & Mate the Seal Point is still Feral after 4 yrs. Dancer kept coming around to visit Hemmey & then there was 3. No more please. I secretly feed a feral I named Manxy when he comes around. Can’t afford it anymore. I liked “Cat Playing With Catnip Toy – Simba And The Catnip Fish.” Catnip makes our cats go into kitty mode. i subscribed as buttmuffin19. my fave video is the feral kitten giving you a high-five! I like the Raccoon Proof Feral Cat Feeder Setup video. 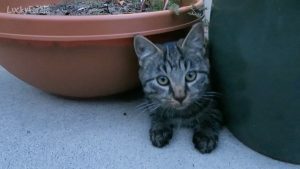 We have been feeding a little stray kitty for the past three weeks and we try to do it in spurts when the cat is around to prevent other animals from getting the food. This cat is not a kitten but not quite an adult. It is too skittish around humans but if our cats are on the screened in patio this stray we call Shiloh will come around and meow/chatter with our boys. No success is catching/trapping this cat yet. Will not go into a carrier or box to get food so someone has probably tried to trap it before. For now its our outdoor kitty that we always look after and Shiloh comes around every single day for food and fresh water. I like the Doll Bed for Cats Unboxing the most of all videos. Lucky ferals win free stuff video. I cant decide if I like the cats or the owner better…..